Alphan Sennaroglu is a Professor in the Departments of Physics and Electrical-Electronics Engineering at Koç University, Istanbul, Turkey. He is also the Director of the Koç University Surface Science and Technology Center (KUYTAM). Between 2010 and 2016, he served as the Dean of the College of Sciences at Koç University. He received the B.S., M.S., and Ph.D. degrees in electrical engineering from Cornell University in 1988, 1990, and 1994. He founded the Koç University Laser Research Laboratory in 1994 and has, since then, led its research activities in the areas of infrared solid-state and ultrafast lasers. He was a visiting researcher at the Massachusetts Institute of Technology during the 2002-2003 and 2009-2010 academic years. He served as the Program Chair of the Solid-State Lasers and Amplifiers Conference (Photonics Europe, 2004, 2006) and Advanced Solid-State Photonics/Lasers Congress (Optical Society of America, 2010-2016). 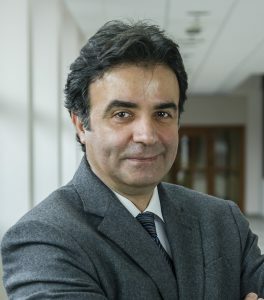 Alphan Sennaroğlu is a Fellow of the Optical Society, a Senior Member of IEEE, and the recipient of the 2013 TÜBİTAK (The Scientific and Technological Council of Turkey) Science Award. He is the author of the book Photonics and Laser Engineering: Principles, Devices and Applications, published by McGraw-Hill in 2010.